This article is about the landform near Gettysburg, Pennsylvania. For other uses, see Devil's Den (disambiguation). Devils Den is a boulder-strewn hill on the south end of Houck's Ridge at Gettysburg Battlefield, once used by artillery and infantry (e.g., sharpshooters) on the second day of the 1863 Battle of Gettysburg during the American Civil War. A tourist attraction since the memorial association era, several boulders are worn from foot traffic and the site includes numerous cannon, memorials, and walkways, including a bridge spanning two boulders. Devils Den was formed with Little Round Top (to the east-northeast) and Big Round Top (southwest) by periglacial frost wedging of the igneous landform formed 200 million years ago when a diabase sill intruded through the Triassic Gettysburg plain. :13 The feature acquired its foreboding name prior to the 1863 battle. Throughout the mid-19th Century, local residents believed that the crevices between the boulders were home to a large snake. The size of the reptile varied between accounts, but reports ranged from 8 ft (2.4 m) to as large as 15 ft (4.6 m). The snake became known as "The Devil," and thus the area he was believed to inhabit became known as "The Devil’s Den." Some soldiers' accounts used the name "Devil's Cave", and a depression on a boulder that collects water resembles a flying horned bat. On July 2, 1863, Smith's Union battery, with six Napoleon smooth-bores, used the hill to counterfire on Confederate artillery prior to McLaws' Assault at 5:30 pm. Against Hood's Assault that started at 4 pm, Devils Den was defended by Birney's 1st Division as the far left position from The Peach Orchard Salient of the III Corps. 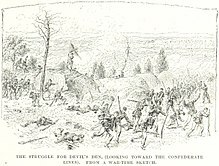 The hill was captured when the "First Texas Regiment, having pressed forward to the crest of the hill and driven the enemy from his battery", and Anderson's Confederates used the hill for the first attack on The Wheatfield. From near the Slaughter Pen, the 40th New York Volunteer Infantry Regiment forced the 2nd & 17th Georgia regiments of Benning's Brigade to retreat to Devils Den. Confederate sharpshooters were stationed between the rocks to fire upon Union soldiers at Little Round Top, among their victims being General Stephen H. Weed and Lieutenant Charles E. Hazlett. Hazlett's guns counter-fired upon them, and many were killed from the concussion of air. The 124th NY monument with Ellis statue was dedicated near Devil's Den in 1884. Postbellum avenues were constructed to Devil's Den such as Sickles' Avenue from the west, Crawford Avenue in 1895 (north),:'95 and Warren Avenue across Plum Run (east). From 1894-1916, the Gettysburg Electric Railway operated on a curve crossing Plum Run (Rock Creek) around the south base of the hill with the Tipton Station providing Devil's Den services. In 1916, a Devil's Den boulder was used as a Satterlee Hospital memorial at Philadelphia's Clark Park. The nearby 1933 comfort station was demolished in 2009, and its access bridge over Plum Run remains to the east. In 1952, ROTC students conducted a mock battle at the site, and the "Devil's Den Access Committee" was formed in 1988. The site's ID Tablet was designated a Historic District Contributing Structure in 2004, and the Devil's Den barricade is structure WA35 on the Gettysburg National Military Park's List of Classified Structures. Post-battle Confederate sharpshooter body staged behind the "Devil's Den barricade" illustrating "a sharpshooter…of Devil's Den" such as the one presumed killed by a percussion of a cannon shot from Little Round Top after Weed and Hazlett had been sniped. Taken in Devils Den of PA militiamen playing "Dead" in November 1863! Devil's Den viewed from Little Round Top. Devils Den (left) is across Sickles Av & Plum Run from the trolley railbed. The area of Devil's Den where the "Sharpshooter" image was staged. Taken 25 May, 2018. ^ "Devils Den". Geographic Names Information System. United States Geological Survey. Retrieved September 16, 2011. ^ Brown, Andrew (2006) . "GEOLOGY and the Gettysburg Campaign" (PDF) (Eleventh printing ed.). Pennsylvania: Bureau of Topographic and Geologic Survey. Retrieved 2010-02-19. ^ "Famous Snake" (Google News Archive). Gettysburg Times. Times and News Publishing Company. Jan 23, 1932. Retrieved 2011-03-15. In September, 1881, the shy blacksnake of Round Top was seen by Hiram Warren, who states his length to be fifteen feet. For over a quarter century this reptile has been known to reside in this neighborhood—it was named 'The Devil', and the place assumed to be its den became "The Devil's Den. ^ Gottfried, Bradley M. Brigades of Gettysburg (Google Books). Retrieved 2011-05-25. ^ Gettysburg National Military Park Commission. "An Introduction to the Annual Reports of the Gettysburg National Military Park Commission to the Secretary of War". The Gettysburg Commission Reports. Gettysburg, PA: War Department. ^ Collins, Jaffe; et al. (April 2001). Clark Park Revitalization Project (PDF) (Report). Philadelphia, Pennsylvania: Friends of Clark Park / University City District. p. 5. Retrieved 2010-09-22. ^ "Devil's Den Barricade". Waymarking. Waymarking. Retrieved 20 October 2018. ^ Groves, James C. (1998). "The Devil's Den Sharpshooter Re-Discovered". JamesCGroves.com. Retrieved 2011-10-24. ^ "Little Round-Top" (Google News Archive). Gettysburg Compiler. October 24, 1899. Retrieved 2011-10-24. Just before Gen. Crawford made his charge … Gen. Weed said to me: 'Martin, I would rather die on this spot than see those rascals gain one inch of ground. I … started to go down…and saw…Weed, reeling and falling to the ground. … [from] Little Round Top … Rittenhouse had a perfect enfilading fire into Pickett's right flank and used it to the best possible advantage.